…the screen pans up, allowing the soft keyboard to be placed under the input field. The input field is highlighted, and text can be entered in the input field using the soft keyboard. When the keyboard is hidden, the screen returns to its original position and the entered text is displayed in the input field. 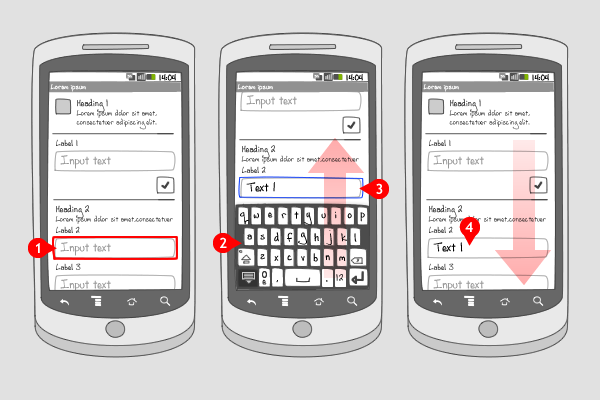 A few modes are used to organize the available space between the application and the soft keyboard. Pan & scan is the default mode for entering text using the soft keyboard, since it is the safest for existing applications. Use the pan & scan mode when your app has input fields that are located below the middle of the screen. 2 ... the input field slides up, making space for the soft keyboard. 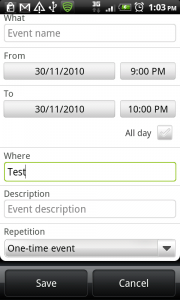 Here, the input field is treated as a seperate view, so the tasks screen stays in its original position. 4 ...the keyboard is hidden, the input field returns to its original position, and the entered text is displayed in the field. 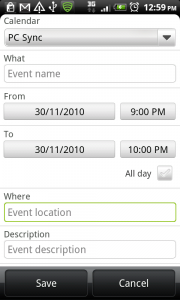 3 ... the screen returns to its original position, and the entered text is displayed in the input field. please forward the code of the above calendar example…..
hi,how did you move the “Save” and “Cancel” button upwards along with the SoftKeyboard ? kindly prompt me on my mail if possible.